Due to rough seas a cargo ship, with its seven crew members, ran aground near Colwyn Bay on the evening of 4th April. Whilst traversing the waters at Llanddulas, the ship collided with a rock on the breakwater, causing it to run aground broadside on the coast. The first thing the emergency services needed to do was save the crew from the stricken boat. They worked tirelessly from two lifeboats and a helicopter, combating the awful weather conditions of gale-like winds and pitching waves. Five of the crew were rescued before midnight but the two remaining members had to stay onboard with the helicopter’s winchman after the winch broke; they were lifted out soon after. Even as the rescue operation was winding down, concerns turned over to the leaking fuel tank. The cargo ship isn’t the biggest vessel around but it still had the capacity to carry 40,000 litres of light diesel. Luckily the rough conditions helped to break up the stuff which leaked, hopefully managing to limit the damage it could do to local natural habitats. Still, the Countryside Council for Wales is keeping an eye on the salvage operation, which is a fairly delicate procedure. In order to move the ship they would first have to empty the fuel whilst replacing it with water, to keep the weight. Then the cargo would have to be removed and the hull would be assessed; following this they would force the water from the tanks so that it would be light enough to float away from the shore it is lodged on. 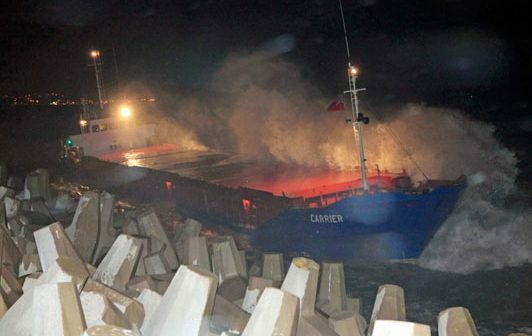 The cargo it had been carrying was limestone, which it had picked up from the quarry jetty before being brought back towards the shore by the waves after the incident at the breakwater. This is the second maritime accident to have involved the same limestone loading jetty in the last six months. Another vessel, the Swanland, got in trouble in the rough waters after taking on the limestone and went on to sink.